It’s been a while since we last published a guest blog, so when Maire-Brid Casey mentioned ‘twitter time’ with students in a recent tweetchat we quickly jumped at the chance to ask her to write one for us. Maire-Brid has kindly written an overview of an initiative to help student physiotherapists use social media professionally and realise benefits in terms of learning and practice. The reach of social media presents exciting opportunities for physiotherapists such as enhancing professional development and engagement with patients and other health care providers. The proportion of physiotherapists using social media professionally is unknown but increasing engagement in the general population is reported (1). Facebook remains most popular with 72% of internet users actively using the site. However, engagement with Twitter is increasing with 23% of online adults currently using the platform, an increase from 16% in 2012. 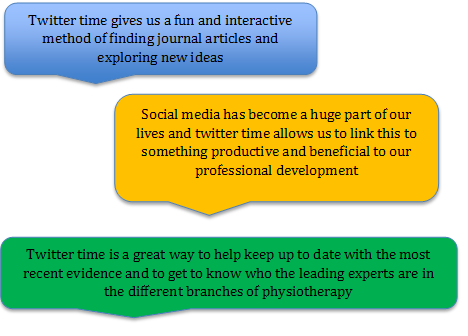 It is clear that there are many physiotherapy students actively engaging with Twitter and finding it helpful for learning and professional development (see recent blog post by @aspiringphysio). However, social media appears to be underutilized as an educational tool for physiotherapy students. Formal guidance on social media engagement currently seems to be lacking in university settings, including coverage of professional conduct on social media. The benefits of professional engagement with social media are well recognised (e.g. https://physiotalk.co.uk/2014/08/12/learning-networking-with-social-media-mdtchat-1-sept-2014-for-therapyexpo/#more-1196). Through my own experience of social media, particularly twitter, I have developed a greater sense of what it means to think critically and view the increasing accessibility to resources and the international physiotherapy community to be invaluable. As a Practice Tutor in Physiotherapy I believed that students who were not using social media professionally were missing out on significant opportunities to enhance their learning and I began to consider how I could incorporate social media into clinical placement as an additional educational tool. 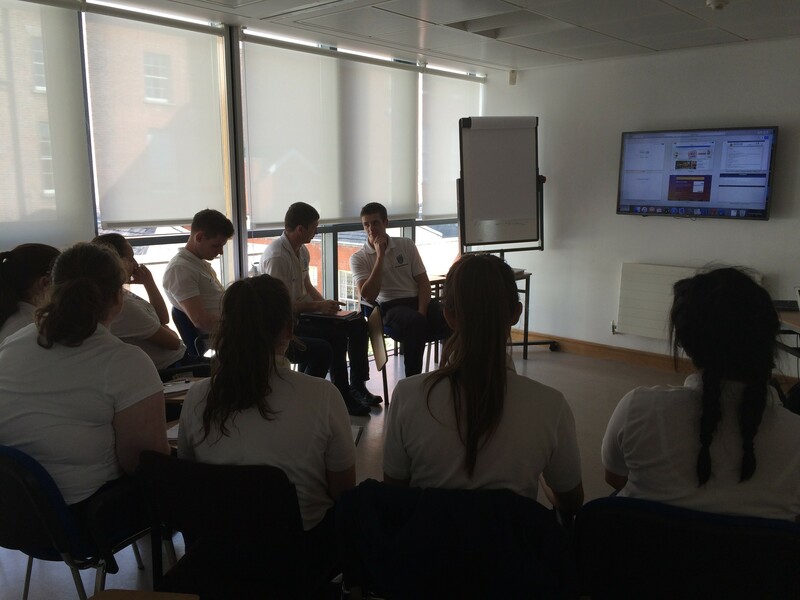 At the Mater Misericordiae University Hospital, Dublin we facilitate groups of up to fifteen BSc physiotherapy students on clinical placement throughout the academic year. The students complete a five or six-week placement in one of the core areas cardiorespiratory, neurorehabilitation or musculoskeletal physiotherapy. With a view to raising awareness of social media with the students on clinical placement, I introduced an initiative known as “Twitter Time”. For the last year Twitter Time sessions have been taking place weekly and for one hour. Students are advised to create a Twitter account and it is recommended that they follow each other. Many students report prior personal use of Twitter but the majority have not previously explored using social media for professional or learning purposes. The first Twitter Time session includes an introduction to what the initiative will involve, guidance on how to set up and use an account and a review of professional code of conduct on Social Media. All students are emailed a copy of the Social Media Highway Code published by the Royal College of General Practitioners. A list of recommended twitter accounts to follow is provided but students are encouraged to actively seek these out depending on their own interests and what is relevant to their current clinical placement. In preparation for the weekly sessions, students are asked to source one item of interest through twitter that they will present to the group the following week. This could be in the form of a blog, research paper, discussion thread, podcast etc. At the Twitter Time session each student is asked to provide a brief overview of the item sourced and also to detail what they learned from it. Twitter Time has provided an alternative learning platform for students that has added to the clinical placement experience. Whilst facilitated by an educator, the sessions are very much student led which encourages a practice of independent learning for the future. The sessions stimulate interactive discussions amongst the group, facilitating skills such as presenting to peers, research appraisal and critical thinking. Examples of topics of discussion have included the effectiveness of core stability exercises for chronic low back pain, awareness of language when communicating with patients, and the effectiveness of techniques such as acupuncture and foam rolling. These sessions also provide a useful forum to introduce the concept of professional disagreement and it is highlighted that there is often no simple answer to many of the questions raised. Twitter Time has proven to be a stimulating and interactive educational tool for physiotherapy students on clinical placement. When facilitated by an educator or tutor there is an opportunity to highlight the importance of professional conduct on social media in real-time. Twitter time offers an alternative to standard tutorials and places the onus of responsibility for learning on the student. The model is simple and effective and could potentially be adapted and used in other settings; clinical or academic. Perhaps it could be an addition to certain physiotherapy modules in the college setting? It may fit well with problem based learning modules for example. We work in an ever-changing healthcare environment and in embracing change we have a responsibility to inspire and educate the future generation of health professionals. Using social media as a teaching tool is a useful means of encouraging active and experiential learning and fostering independence and creative thinking. Maire-Brid Casey @brid_maire is a Practice Tutor and MSK Physiotherapist working in Pain Rehabilitation.